We have exciting news for business owners in the greater Columbia SC area! 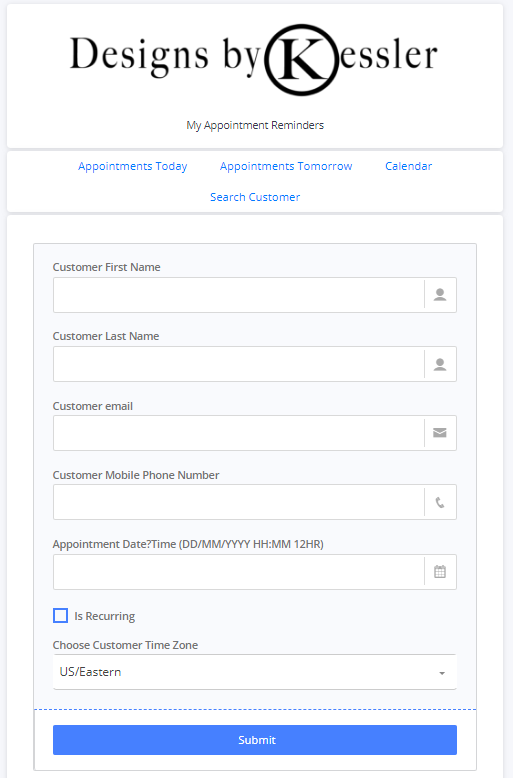 We are now able to offer an appointment reminder service for local businesses to use! It does not get any easier than this for a business to schedule reminders for their clients or patients. No, really. We will set up the remind message wording and the frequency of the reminders. All the business needs to do is enter their client’s or patient’s name, phone number, next appointment date/time, and email address if you want to also send an email reminder. The input screen is on the right. 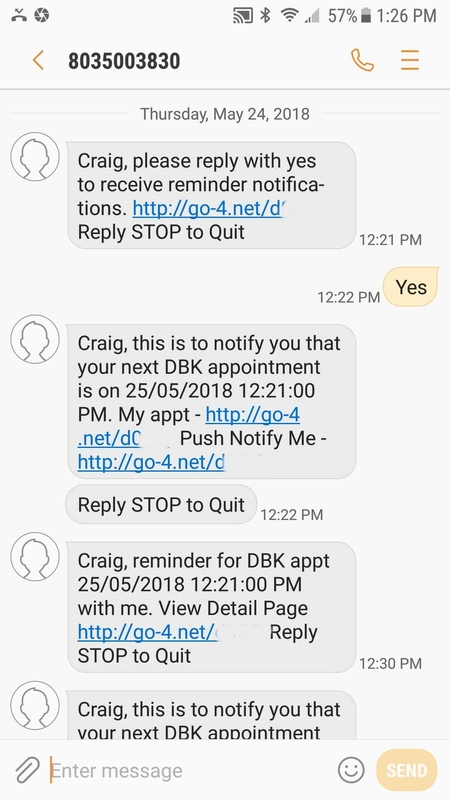 You might already have an appointment reminder program sitting on your computer and are not using it because it is too difficult to figure out, or too time consuming. We have solved both of these issues. You can choose if you want your reminder messages to be sent as either a text message, a push notification (to a phone and computer), or as an email. Choose one or all three! Again, we will set up what messages get sent in what format. All you will need to do is help finalize the actual wording of the messages with us. Then, you or your staff will enter in your customers or patients name, phone number and next appointment date/time when they are set. 1. Your customers will receive an initial text message to give permission to send text messages to their phones. 2. Each message then, will have a link to an individual appointment details page for the customers.y our customers can send a message back to you with questions or to reschedule. This message can be sent to you via email and/or text message. Wish You Could Send a Message to ALL Your Customers on the Fly? Sending individual appointment reminders is only half the power of this system. You can also send a mass text and/or push notification to ALL your customers who are in your database. This is huge, for the open rate of text messages and push notifications is close to 100%! Again, we have made this as easy as possible all you need to do is type your message. We take care of the rest. We can show you in person how all this works in about 3 minutes. That’s how simple it is. 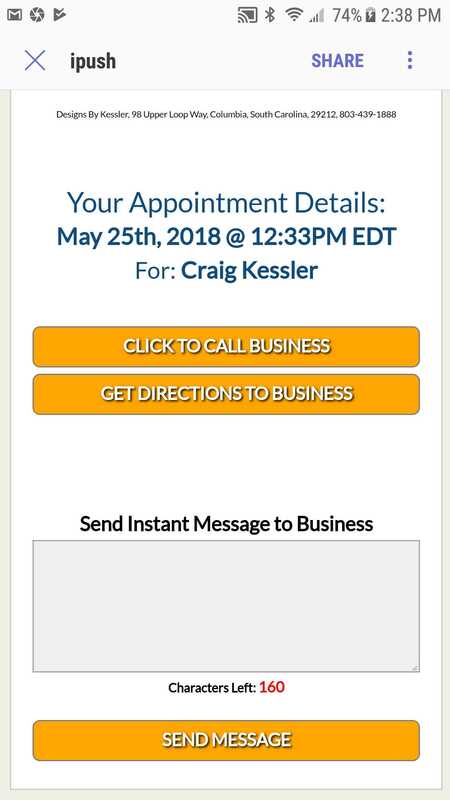 Designs By Kessler is here to answer any questions you may have on getting set up to send appointment reminders to your business’s customers. Do not hesitate to contact us!